RoboMarkets, the company that provides investment services on European financial markets, has opened access to trading CFDs on cryptocurrencies. 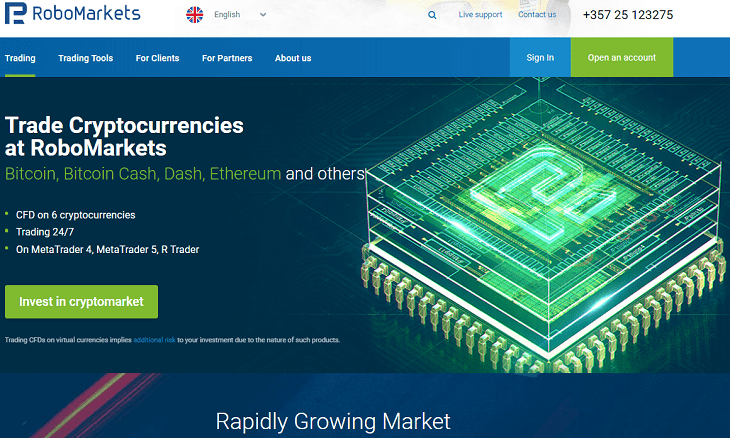 Some of the most popular cryptocurrencies on the market, such as Bitcoin, Bitcoin Cash, Dash, Ethereum, Litecoin, and Ripple, have been added to the list of available trading instruments. The new instruments are available in MetaTrader 4, MetaTrader 5, WebTrader, and R Trader terminals. The following instruments are now available to RoboMarkets clients: BTCUSD, ETHUSD, BCHUSD, DSHUSD, LTCUSD, and XRPUSD. The maximum admissible leverage is 1:5. The above-mentioned instruments may be traded on Pro-Standard, ECN-Pro, Prime, Pro-Affiliate, ECN-Pro Affiliate, and R Trader accounts. In addition to that, R Trader platform offers clients an opportunity to buy cryptocurrencies without swaps (Overnight Fee) with the leverage value of 1:1. More details about trading conditions for CFDs on cryptocurrencies can be found on Contract specifications page of RoboMarkets website. Unlike the trading instruments introduced earlier, cryptocurrencies may be traded 24/7, including weekends, when currency pairs and stocks are not available for trading operations. This factor provides traders with an opportunity to use more trading strategies, which require some extra time to add to a usual business week. RoboMarkets is an investment company with the CySEC license No. 191/13. RoboMarkets offers investment services in many European countries by providing traders, who work on financial market, with access to its proprietary trading platforms. More detailed information about RoboMarkets can be found on the official website at www.robomarkets.com.